Nothing was said; nothing about the success or how long this took to complete. More information should be included. 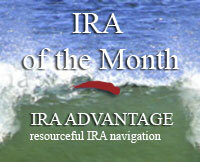 It, “IRA OF THE MONTH” could be written in away that showed how it was done and a timeline, including the outcome!